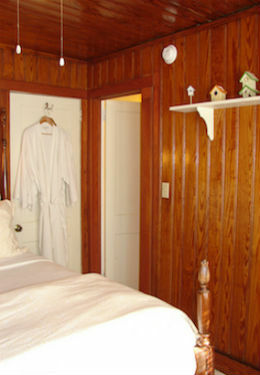 Suite Bird is a spacious two room suite that is welcoming and bright with tasteful reminders of our feathered friends. Located midway through the house on the second level, this room is close to both the front upper level porch and back deck. 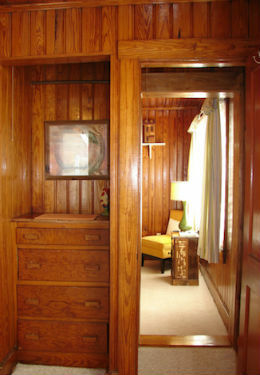 Knotty pine boards line the walls and ceiling, making this room unique and popular among travelers looking for something different. A relaxed queen-size bed and private “en-suite” bathroom with stand-up shower complete this one-of-a-kind room. A 32 inch Smart TV with Roku is located in the seating area lounge adjacent to the bedroom. Each room is approximately 12’X10′, cooled and heated by individually controlled mini splits and has a maximum occupancy of two adults. Review amenities & packages and book your next beach vacation today.